Part of SRT's 3 Titans of Theatre series, this was an extremely well-directed Morality dramedy (for a lack of a better word) play by legendary director Yukio Ninagawa that daftly balanced comedy with Bhuddist teachings (without ever being preachy) and serious philosophical questions on Morality, Government and Self, the Philosophy of War, and Redemption/Revenge that echoes that words of Kant, Hobbes, Machiavelli, Locke and Rousseau. The biggest challenge in bringing this play to Singapore is translating the Japanese historical culture and making it accessible to Singaporeans. And in this case, I think they did a brilliant job. However, most of my audience were, unfortunately, lost in this non-familial cultural abyss. 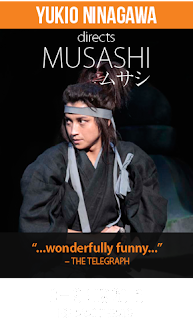 It is therefore essential to not only know about the basic background of Musashi Miyamoto and his duel with Sasaki Kojiro, but also understand, appreciate and differentiate Noh and Kyogen theatre (the website at SRT's page gives a good primer). The many inappropriate, in my opinion, laughters in an otherwise farcial drama drowned out many of the actors' words (and it was mainly the non-Japanese crowds who were laughing). That and the rather inaccurate (and very brief) translations were the downside to this otherwise absolutely brilliant play (also, some of the translations came before the line was spoken and this was really bad when it was punch line, with audience members sniggering even before the moment had arrived). Ninagawa's direction was superb, from the prologue with the blazing sun to the exceptional Scene 1 introduction (that was WOW! a coups de théâtre), the direction constantly kept me speechless. A relatively simple set, that barely changed at all, and a full cast that was on stage at almost all times, there was no waste, no mess, and Ninagawa really knew how to direct your focus. Even if your focus should waver, especially when the one sentence English translation is actually more like 5 or 6 Japanese sentences long, there were always other small things that the non-core characters-of-the-moment were doing. They aren't all just standing by the side hoping that the audience do not notice then. Then there was the amazing use of the soundtrack. The bamboo would rustle to signify "a moment"; the cicadas would sound to emphasise "the silence"; birds would chirp when morning has arrived; and soft music would play to heighten the dramatics of the scene. The actors were all standouts. None of them were wallflowers. They all acted their roles with aplomb, of course the ones that were the standouts had the most comedic reliefs. The 2 young leads were also arresting with Tatsuya Fuijwara as the older Musashi Miyamoto being the more assured one as compared to Junpei Mizobata's Sasaki Kojiro. This was an amazing play that rightly deserved its standing ovation and double curtain call. One comes out of it with a sense that screenwriter Hisashi Inoue had taken a lot of effort to translate and distill many teachings/philosophies into an accessible avenue for the masses; teaching, without preaching, the sanctity of Life.